Erected by James Sutherland in memory of his wife. 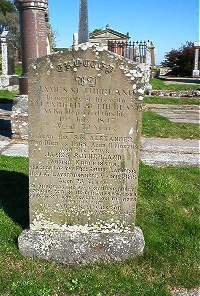 Elizabeth Sutherland died 19th July 1845 aged 32. Son Alexander died 1865 in infancy. Husband James Sutherland, farmer of Knockinnon and elder of the Free Church Latheron, died at Latheronwheel March 1885 aged 73. In business he was scrupulously upright and in his Christian profession consistent and zealous for the truth. 2nd wife Elizabeth McGregor died 3rd December 1900 aged 84.